If video game currency is to exchange with real life currency, then it must have a powerful economic entity to guarantee the exchange rate. Furthermore this entity is none other than a country’s government. But why would a government guarantee the ability to exchange video game currency with real life currency? War can also be fought with currency. Winning victory without firing a shot is a way to topple a country. A game where real money can be exchanged, a super money-making machine. Its name is <<Zero>>, and it is a financial explosion from head to tail. The MC is a son of chaebol, richer than a king, a beauty beyond a man, a heart purer than a fool. When people got buried by crowd of people, he swam on top of people. When he got no money left, the NPC will lend it. When he embark on a journey, the first city he found is the "lost city". When he hit a tree, the firehell wood will drop (super rare drop). When his sword broke because he is a blacksmith who dont know how to repair,... more>> the dungeon guard will lend him the quest sword reward. I tired to like this Light Novel. 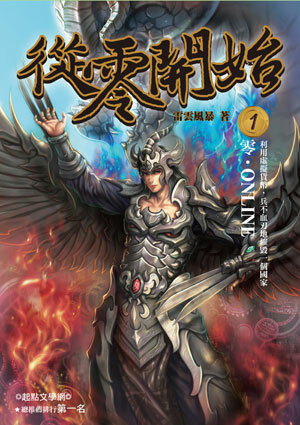 I typically enjoy reading VRmmorpgs Ding Fest/Japtem novels like LMS (Legendary Moonlight S) It even has an interesting background story about using the game to wage war in the Synopsis. It has a good translator. I read someone else review on another Novel, and he put it really well.... The plot armor is measured in miles, not inches. A second gen rich spoiled young master enters a game. "Romance"- Which consists of a few chapters showing sympathy to a girl and assisting her gets them into a relationship. Go figure. I don't say this lightly, but this novel was actually bad. Just bad. I can handle ridiculous luck in these sorts of novels. Zhan Long and similar novels are full of miracle encounters and BS luck. I enjoy them despite that. This novel seems like the author was too lazy to even come up with those opportunities. Instead of gaining access to some ridiculous quest or creating your own skill, the author gives the MC overpowered power ups right at the start simply because the MC was one of the... more>> first to buy a game helmet. If you want a novel without serious thinking then you can read this. Each chapter is long and until now there not many exciting battle. But it's quite funny how his interaction with NPC and how super his luck. ... gave it a try but it goes from bad to worst as you read on and frankly many fan-fictions are better than this. Romance 0/100 star: He meets a girl more beautiful then himself she gets in danger he helps her she is his now... no plot no work all within a few chapters.. I couldn't read past chapter 6. There's just way too much self-praise and superficial childish attitude from the main character. He literally is rich and "lucky" and literally the novel revolves around him. Right from the start, it felt so narcissistic and snobby. Another problem is how the game mechanic is so unbelievable now, while being super cliche at the same time. It borders on "fascination", the bad kind of fascination where it is in your face. The game literally also revolves around him. Not the best novel out there. It's a good read if you just turn off the common sense from your brain. MC has a tremendous bullsh*t luck. Mostly comedy and just teeny weeny bit of seriousness. Just don't expect much the novel. I gave it 4 stars cuz I like my common sense turned off once in awhile. Its like watching one of those meme videos on youtube, stupid but makes you laugh. Reads like a fanfiction written by a 5 year old. Literally. Let's see, super rich young master, incredibly beautiful despite being a guy, insane luck to the point where even randomly buying stocks would make him one of the richest people alive, not counting his parents' money, rolling the dice for 4 numbers nets him a 1 out of 10 spots to be a super rare angel/demon descendant which enhances his super good looks even more. Game mechanics are bland, and as far as I can tell, are only there to... more>> make the MC even more powerful because he can somehow bend them to his wish whenever he likes. To be fair though, its not like they're described consistently or in great detail, so the MC seems to get away with a lot of stupid sh*t that no one else can, because everyone else is an idiot never thought about testing the limits of the game engine like real life players would. In most novels, the author would at least make an attempt to disguise something as a bad thing, even though its obvious that its going to be the MC's winning mechanic, such as OverGeared. In this novel, the author either can't be bothered, or is simply that stupid because he or she is still a child. Non-stop self praise disguised as complaints about his poor, restricted life and more and more outlandish attempts at making the MC some sort of super human with best god level pets/equips etc, simply come across as incredibly tedious and whiny. All I can say is that this story is interesting despite what people say about how lucky the MC becomes. The MC does not become OP like other MC's from other stories, he relies on his friends and allies to help him get through tough challenges. Now I get all the comments about having to really work hard to suspend your disbelief. I've never played a game where a player can go from zero to level twelve in half an hour (unless someone else was leveling them). yup, twelve levels in a half hour killing spotted deer. he manages over level twenty before the first day is done, and that's just in the first three chapters. I enjoy mindless entertainment as much as the next person but this is one of the worst I've ever seen. I... more>> don't think I can turn off my brain enough to actually enjoy it, though I have gotten a lot of practice in rolling my eyes as I read, so at least I got some mild eye exercise from the experience.